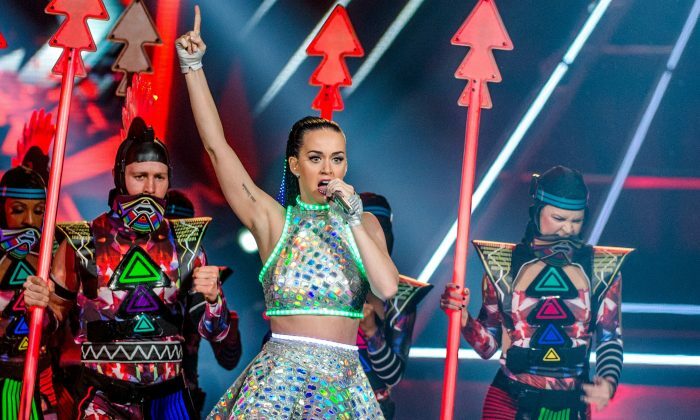 Chinese netizens in Taiwan and the mainland wonder if American singer Katy Perry will be barred from China for her latest concert costume stunt. The Chinese regime’s censors were quick to delete all online evidence of it. 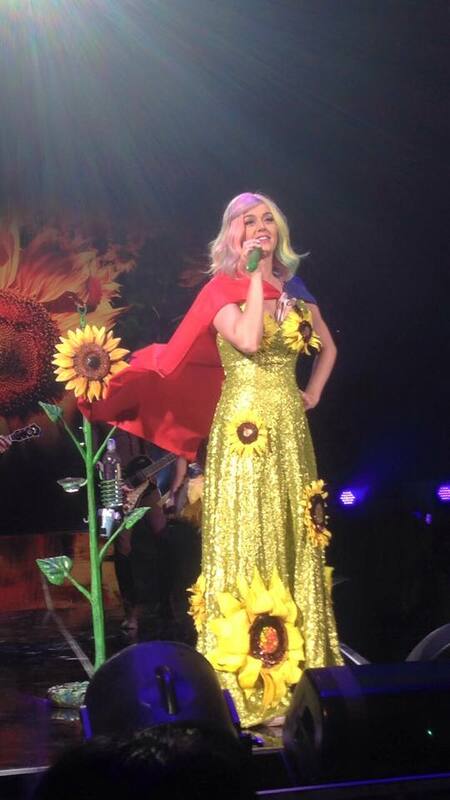 While performing at the Taipei Arena in Taiwan on April 28, Perry, who was wearing a dress covered with sunflowers, grabbed a Taiwanese flag from a member of the audience and wore it as a cape as she sang the song “Unconditionally,” Hong Kong-based Apple Daily Taiwan reported. The flag and dress are politically-charged symbols in Taiwan and China—the Republic of China flag stands for Taiwan’s independence from China, while sunflowers symbolize the anti-mainland protest in March 2014 where students occupied Taiwan’s legislature for 24 days. It is unclear if Perry intended to make a political statement because she has used the sunflower theme in earlier concerts, and appeared to have donned the Taiwanese flag on the spur of the moment. But ad hoc or not, Perry’s costume moved some fans to tears, according to Taiwanese newspaper Liberty Times Net. Taiwanese netizens also took to social media and web forums to express thanks for what they perceive as Perry’s support for Taiwan. The reaction across the Taiwan Strait was less enthusiastic. References and pictures of Perry’s concert were quickly removed by censors, and Chinese news sites instead highlighted the hour worth of delays in the concert. Meanwhile, some users of the popular Chinese social media platform Sina Weibo expressed annoyance at what they felt was a lack of political sensitivity displayed by “Fruit Sister”—a nod by Chinese fans to Perry’s snazzy fruit-themed costumes. The one discussion common to both China and Taiwan netizens was whether Katy Perry would be banned from performing on the mainland for her stunt. The Chinese regime is known for banning foreign artists who are too vocal in promoting things it doesn’t agree with, or who could potentially be trouble. Notably, American folk singer and counterculture icon Bob Dylan was blocked in 2010 after Iceland’s Bjork showed support for Tibet’s independence in a Shanghai concert. The Communist Party’s paranoia has also inspired self-censorship—American saxophonist Kenny G removed social media photos of himself at a demonstration site in Hong Kong during the Occupy protests last year, and declared he was “not trying to defy government orders” and doesn’t support the protests. Some netizens think Katy Perry’s status will protect her—”It’s impossible for China to ban an American superstar,” writes “robotcl” on PTT—but performing in China is something Perry will only have to worry about next year as she has already toured the mainland this month. Chinese censors picked the wrong Hong Kong celebrity to prove a point. Taiwan told that "One China" policy is a requirement for any deals, during meeting of leaders in Beijing.